The Time-Crunched Cyclist reveals the fastest way to get fit for road racing, century rides, gravel grinders, cyclocross, Gran Fondos, and mountain bike events. With elite cycling coach Chris Carmichael's innovative, time-saving approach, busy cyclists will develop fitness, speed, and power in just 6 hours a week. Now powered by Strava, this updated third edition of The Time-Crunched Cyclist training program taps into the most popular cycling social network to help cyclists get fired up to crush their workouts, one segment at a time. Through his popular endurance coaching service, Carmichael noticed that many busy cyclists are unable to make performance gains using conventional training methods; they simply don't have enough time to train. So CTS developed a new approach--the Time-Crunched Training Program--to help cyclists achieve competitive fitness and power without the impossible time demands of traditional training methods. This new, third edition integrates Strava, the popular ride tracking and analysis program. Powered by Strava, the Time-Crunched program becomes interactive, social, highly motivating--and focuses riders on the training data that matters most. It also adds the Time-Crunched Diet, a sports nutrition approach designed to help riders optimize their power-to-weight ratio with new guidelines on eating behaviors and delicious recipes from chefs Michael Chiarello and Matt Accarrino. A new chapter on hydration and managing heat stress will show athletes simple ways to avoid overheating that lead to better performance. The Time-Crunched Cyclist can help you capture your best performance--all in the time you have right now. Chris Carmichael was an Olympian and a professional cyclist before beginning his career as a coach, best-selling author, and entrepreneur. He has coached elite cyclists since 1990, was recognized as the U.S. Olympic Committee Coach of the Year, and was inducted into the U.S. Bicycling Hall of Fame in 2003. He served as the men's road coach for the U.S. Olympic Cycling Team during the 1992 Olympic Games, and was the head coach for the U.S. Cycling Team for the 1996 Olympic Games. Carmichael founded Carmichael Training Systems (CTS) in 2000 to make world-class coaching expertise available to everyone. Through Chris's leadership and an unsurpassed education program that develops the highest-trained coaches in the industry, CTS immediately established itself as the premier destination for personal fitness, nutrition, and performance coaching and camps. CTS's proven track record for producing champions continues to attract top amateur and professional athletes, including Ironman(R) world champions Craig Alexander, Tim DeBoom, and Normann Stadler; Olympic triathlon gold and silver medalist Simon Whitfield; NASCAR drivers Carl Edwards and Bobby Labonte; five-time U.S. national cyclocross champion Katie Compton; and two-time cyclocross national champion Ryan Trebon. In addition, Chris has created more than a dozen training DVDs and authored five books, including The Ultimate Ride (2003), the New York Times bestseller Chris Carmichael's Food for Fitness (2004), and 5 Essentials for a Winning Life (2006).Jim Rutberg is the Media, Marketing, and Editorial Director and a coach for CTS. 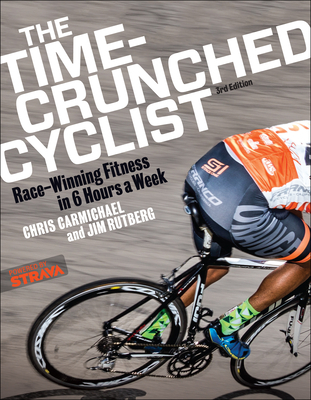 He has co-authored 8 books on training and sports nutrition: The Time-Crunched Cyclist, Training Essentials for Ultrarunning, The Time-Crunched Triathlete, The Ultimate Ride, Chris Carmichael's Food for Fitness, Chris Carmichael's Fitness Cookbook, The Carmichael Training Systems Cyclist's Training Diary, and 5 Essentials for a Winning Life. In addition to books, he has written innumerable blog and magazine articles. His work has appeared in Road Bike Action, Bicycling, Outside, Men's Health, Men's Journal, VeloNews, Inside Triathlon, and more. A graduate of Wake Forest University and a former elite cyclist, Rutberg lives in Colorado Springs with his family.